B.C. has many roads that are named for their geographic, cultural or historical relevance, like the Yellowhead Highway which bears the nickname of blonde-haired Iroquois-M�tis explorer Pierre Bostonais. But there’s only one B.C. highway that’s numbered after a historical event – that’s Highway 113. Improved highways brings tourism, trade. Highway 113, also known as the Nisga’a Highway, heads northwest into the Nass Valley from Terrace. 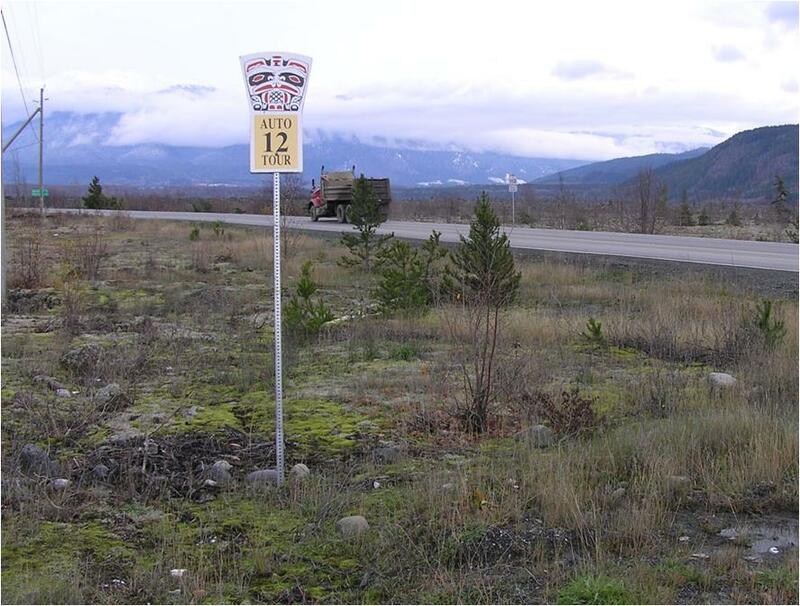 The highway number marks the years it took for the Nisga’a Nation to reach a treaty agreement with the governments of Canada and British Columbia. The Nisga’a Nation’s journey began in 1887, when a group of Nisga’a chiefs paddled from their remote home to Victoria, to speak to provincial representatives about resolving issues with newcomers arriving in Nisga’a traditional territory. 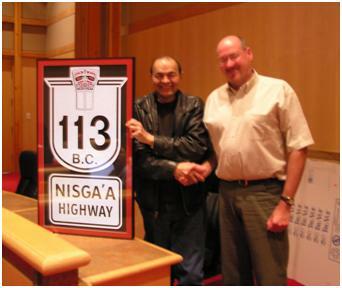 In 2000, the historic Nisga’a treaty was signed, and part of it required that the road to three Nisga’a villages be paved and brought up to provincial highway standard. A 30-kilometre road was also to be built to provide motor vehicle access to the village of Gingolx, which was accessible only by boat and floatplane. The Nisga’a Nation and the Ministry of Transportation and Infrastructure have since worked in partnership to fulfill the terms of the treaty related to roads, and to upgrade and maintain the highway. Nisga’a people were employed on the road improvements and the new link to Gingolx. The ministry continues to provide road maintenance and safety improvements, as it does around the province, to protect lives and support trade. This summer, the Nass Valley will receive its second webcam near the village of Gitwinksihlkw, at the intersection of the Nisga’a Highway and Anlaw Road. (The first webcam near Laxgalts’ap was installed in Fall 2010.) The single-lane Diksangiik Bridge between Laxgalts’ap and Gitwinksihlkw is also being replaced with a two-lane bridge, so motorists will no longer have to yield to oncoming traffic. (The log cribs the old bridge is founded on are deteriorating, while the new 18-metre concrete bridge will be built on two concrete abutments and steel pipe piles, to withstand potential future washouts.) Also, roadside barriers are being installed along Kalum Lake where the hilly, windy route makes some steep descents. These improvements help keep motorists safe in their travels. The Nisga’a treaty ended uncertainty about land ownership and improved economic opportunities, including tourism, for the Nisga’a Nation. Visitors rely on a good highway to enjoy the area’s dramatic mountains and pure waterways, Nisga’a Lava Beds Memorial Park, and the recently-built Nisga’a Museum at Laxgalts’ap, also known as Hli Goothl Wilp Adokshl Nisga’a, which houses more than 300 cultural treasures. For the first time in modern history, the Nisga’a people have the legal authority to conduct their own affairs. The Nisga’a Lands Department carefully monitors road conditions and works with the ministry on a government to government basis. Nisga’a enforcement officers and the RCMP sometimes conduct road checks to keep the Nisga’a Highway and communities safe. The Nisga’a chiefs travelled a long way in 1887, and the numbering of Highway 113 recognizes the Nisga’a people’s steady persistence. cheers to the Nisga’a nations accomplishments.